The latest edition of Intuit’s market-leading small-business accounting software builds mostly on innovations made in previous QuickBooks editions, with tweaks that some customers may find useful. But this year’s model has no killer feature that would make the software a gotta-have-it upgrade for all existing users. So unless you really covet a specific new feature--or face loss of online functionality due to Intuit’s ongoing sunset policy (which will affect 2009 editions in several months)--you have no need to spend the $200 to $360 that Intuit charges for upgrades to QuickBooks Pro 2012 and QuickBooks Premier 2012, respectively (prices are as of September 19, 2011). None of that is meant to belittle Intuit’s track record for making software that helps small-business owners keep their books, assess their financial health, and manage many related chores such as payroll and bill payments. Although newcomers to small-business accounting (who must pay $230 for QuickBooks Pro 2012 or $400 for QuickBooks Premier 2012) can find less-expensive desktop or Web-based software, QuickBooks offers unparalleled flexibility, especially given the abundance of third-party add-ons, available on Intuit’s website, that enhance its functionality. The Contributed Reports library adds more than 1000 reports. I looked at QuickBooks Premier 2012, the more expensive and full-featured edition, with versions tailored to accountants, contractors, manufacturers and wholesalers, nonprofits, professional service firms, and retailers. However, most of the new features are also present in QuickBooks Pro, which should meet the needs of startup businesses that don’t require advanced inventory or invoicing functionality. No matter which version a new user chooses, Intuit continues to make getting started as painless as possible. A couple of screens request only very basic company ID information and the business type to set up a recommended chart of accounts; after that, you can add data such as customer or inventory information, or go straight to common business tasks such as creating invoices or estimates, adding the data you need on the fly. Several new features enhance QuickBooks’ already robust reporting capabilities, including the option to share customized reports you’ve created and access those made by others. Although QuickBooks comes with more than 100 preset reports, the Contributed Reports library--accessible via a single click in the Reports Center--adds more than 1000 reports under the general categories of sales, employees, time and expense, and so forth. Reports can be an invaluable tool in figuring out what’s going on with your business, and the Contributed Reports library looks like a great resource. Calendar View lets you peg transactions to dates. A new Calendar View lets you see upcoming events--deadlines for bills and invoices, to-dos, and such--in a calendar, as opposed to a list. I’d like this feature more if it could integrate with whatever calendar you’re already using, but it has no support for third-party calendar integration. A Lead Center provides basic CRM functions. Another possibly useful innovation is the Lead Center, which provides basic support for tracking interaction with potential customers--essentially, a rudimentary CRM tool. Because QuickBooks previously had no such functionality, Intuit says some users were either maintaining lead info on spreadsheets (or other apps) or entering lead data into the customer database, which can produce some awkward reporting issues (distorting sales reports, for example). You can add lead information one entry at a time, or cut and paste multiple entries from an Excel spreadsheet (after moving columns to conform to the mapping that QuickBooks requires). Once a lead becomes a customer, you can easily move the lead data to your customer database with a single click. Users who desire more-robust CRM functionality now have the option of integrating this software with Salesforce.com through the new Salesforce for QuickBooks add-on (which I did not try out for this review). Intuit also added a Document Center, where you can add file attachments or scanned documents for linking to transactions (by clicking an Attach button on a specific transaction window). You can, however, attach a document to a transaction without first putting it into the Document Center, in which case clicking the Attach button brings up the Document Center window. Attachment support has been a bone of contention for some users since Intuit charged for this feature in the past. QuickBooks Premier users also get an Inventory Center for one-stop access to inventory-related activities, including specific item information, reports to identify issues such as low inventory, and Excel import/export functions. While inventory features aren’t new to QuickBooks, the Inventory Center should help streamline these activities for inventory-centric businesses. 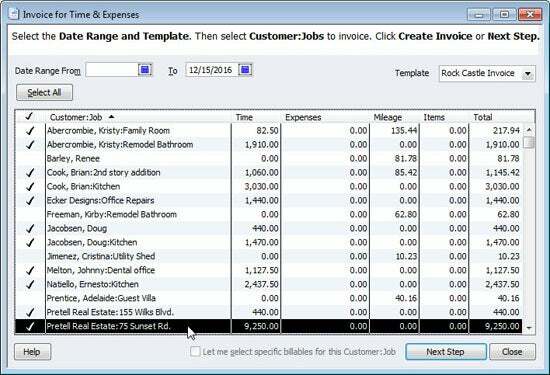 Another feature exclusive to Premier editions is the ability to create batch time-and-expense invoices. Last year, QuickBooks added batch invoicing, but only for standard, identical transactions (for example, a gardener might charge a lot of customers $50 a month). 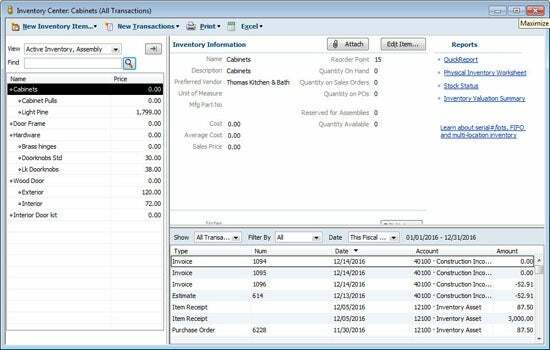 QuickBooks Premier 2012 lets you create invoices from a list of customers who have incurred different charges--you simply check off the ones with a billable balance for the date range you choose. This feature will be a definite timesaver for larger small businesses with many customers. All editions of QuickBooks 2012 support batch creation of employee timesheets--but only for staffers who work the same hours, since you create the timesheet and then check off the applicable names. For businesses with employees who work different hours, this feature isn’t particularly helpful. More potentially timesaving is a so-called one-click feature that simplifies the transfer of data for related activities. For example, you can now easily convert an estimate into a sales order, purchase order, or invoice by clicking the Create button in the estimate window. Other Create options include generating a letter using boilerplate copy, or memorizing the transaction if it’s something you do regularly. With one click, you can turn a purchase order into an invoice. QuickBooks becomes more expensive if you need to have more than one-user access, and Intuit is happy to sell you other services that can save you time or add convenience--most notably payroll, mobile access, and direct-deposit/bill-pay services. Very small businesses may not need all the bells and whistles that QuickBooks offers, and should consider a Web-based service such as Wave Accounting or even Intuit’s own QuickBooks Online Simple Start. But for newcomers with employees to manage, inventory to track, or a genuine interest in monitoring the financial workings of their business, QuickBooks continues to offer great tools in a reasonably accessible user interface. For existing users, QuickBooks 2012 may not be a huge leap forward, but it certainly provides a number of incremental improvements for those who were looking to upgrade anyway. QuickBooks 2012 will be available for download September 26, with general retail availablity to follow on October 9. QuickBooks remains the leader of the small-business accounting pack, although most users can get by without spending hundreds of dollars for this upgrade.